Saturday December 1 marks the 9th Annual Ithaca Alternative Gift Fair. The mission of the Ithaca Alternative Gift Fair (IAGF) is to provide our community with a meaningful alternative to holiday gift giving, one that celebrates personal charity, community health and well being, and the preservation of the planet. I learned about the concept of an Alternative Gift Fair in 2000 from my brother, Seán, who was working at the Center for a New American Dream, whose mission is to help Americans reduce and shift their consumption to improve quality of life, protect the environment, and promote social justice. Seán introduced our family to alternative gifts at Christmas that year. He gave me a gift of having the locks changed for a victim of domestic violence, which meant that he gave a donation to an organization that provides support for women and children in abusive situations. I received a card with a description of the gift that he made in my name, explaining how the donation would be used. I remember feeling touched when I received that gift, which had a more meaningful, far-reaching impact than any wrapped box I might have opened that day. In 2004, I was working at the Committee on U.S.-Latin American Relations (CUSLAR) and decided that an Alternative Gift Fair would be a great fundraising opportunity. The Center for a New American Dream provided a toolkit for organizing an Alternative Gift Fair and offered support for communities who were looking to establish Alternative Gift Fairs around the country. 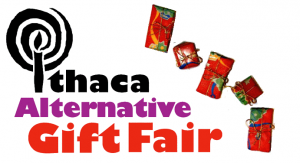 Almost immediately, an organizing committee formed and planning for the first Ithaca Alternative Gift Fair was underway. CUSLAR was a project of CRESP (now Center for Transformative Action, CTA), and Anke Wessels agreed for CRESP to be the fiscal agent for the Alternative Gift Fair, which enabled shoppers to make a single tax deductible donation for all of their gifts. CTA continues to serve as the fiscal agent for the IAGF and distributes the donations to each participating organization. At the first IAGF in 2004, 19 organizations participated and raised over $8,000. At the time, CUSLAR and Recycle Ithaca’s Bicycles (RIBs) were collaborating on a project called Bikes for Chiapas, working with Schools for Chiapas to send bicycles to a Zapatista community in Mexico. One of the gifts that CUSLAR offered that first year was $10 to send a bike to Chiapas. Now in its ninth year, the Ithaca Alternative Gift Fair has become a popular annual event enjoyed by non-profit organizations and community members alike. The event is great fun and 100% reliant on volunteers. “It represents what I love about Ithaca,” one person commented on the spirit of the Fair. The 2012 Alternative Gift Fair will be held on Saturday, December 1 from 11:00 AM to 6:00 PM in downtown Ithaca at two adjacent locations on Dewitt Park: the First Presbyterian Church and the First Baptist Church. For two weeks following the Fair (from December 2 until December 16), donations will be accepted through the IAGF website for shoppers who are not able to visit the Fair in person on December 1. The event is sponsored by the Center for Transformative Action, with generous support from: Acorn Designs, Alternatives Federal Credit Union, First Baptist Church, First Presbyterian Church, Tompkins Community Action, and Tompkins County Public Library. Ithaca Alternative Gift Fair is online at: www.ithacaaltgiftfair.org and on Facebook at: www.facebook.com/IthacaAltGiftFair. For more information email ithacaalternativegiftfair@gmail.com. Meaghan Sheehan Rosen is a founding member of Ithaca Alternative Gift Fair organizing committee. She is the Program Coordinator for Friendship Donations Network, an Ithaca based non-profit whose mission is to rescue fresh nutritious food from stores and farms that would otherwise be thrown away and redistribute it to our neighbors in need.